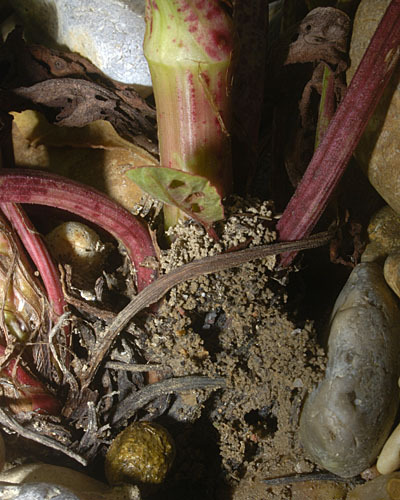 Colonies of Dysaphis radicola on the basal parts of Rumex (dock) are usually heavily ant-tented with soil particles (see first picture below). 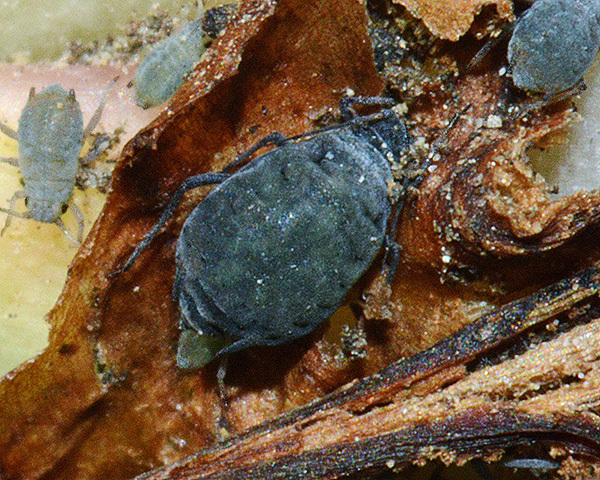 Apterae of Dysaphis radicola are greyish-brown to lead grey or greyish-green (see second picture below), and are slightly to moderately wax powdered. Spinal tubercles are present on the head and abdominal tergites VIII, or VII and VIII. The longest hairs on the third abdominal tergite are shorter than the basal diameter of the third antennal segment. Dysaphis radicola siphunculi are 2.0-2.5 times longer than the cauda. Immatures (see third picture below) are grey-green with orange patches around the siphunculi. 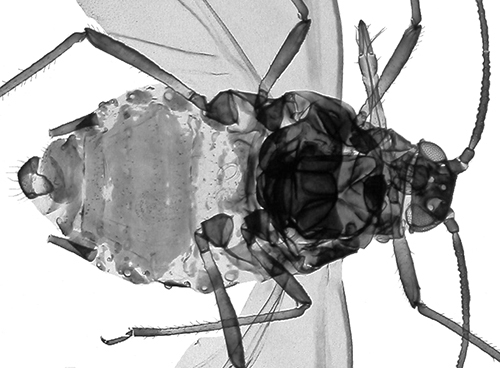 The alate of Dysaphis radicola always has marginal tubercles on abdominal tergite 7. The micrographs below show an adult aptera and an alate in alcohol. 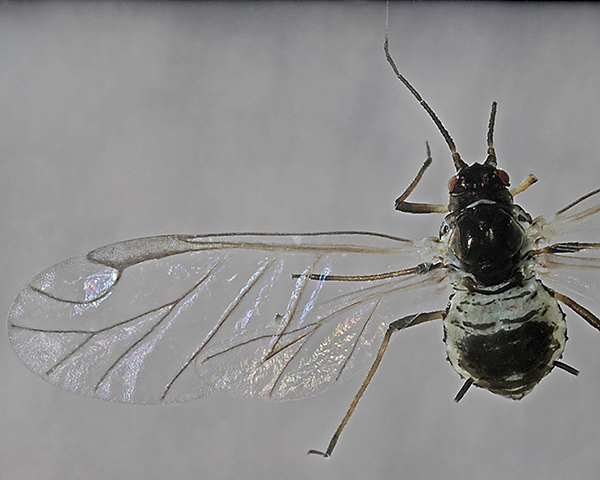 The clarified slide mounts below are of adult viviparous female Dysaphis radicola : wingless, and winged. In most of Europe Dysaphis radicola host alternates from Malus (apple) to the roots of Rumex (dock). The small primary gall near the apex of the apple leaf produced by the fundatrix comprises a longitudinal fold near the mid-rib (transverse for related Dysaphis species). Subsequent generations roll and redden the lateral margins of leaves of Malus (apple) in the same way as its close relatives. Alates produced in the second generation migrate to the roots of Rumex (dock). This host alternating aspect of Dysaphis radicola biology is lost in British (and other) populations, and the aphids stay on dock all year. On dock the aphids feed at the base of the plant where they are attended by ants. 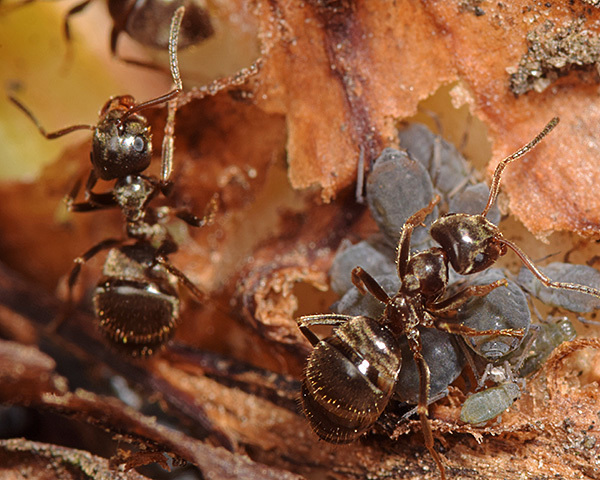 The ants usually tent over the colony with soil particles. 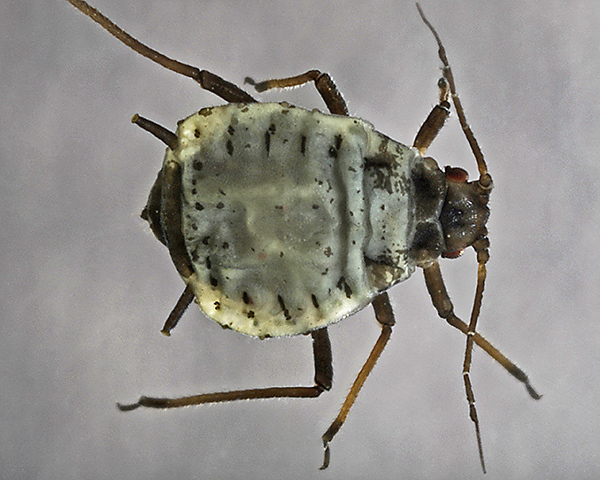 Dysaphis radicola occurs throughout Europe, in the Caucasus, in Japan and Australia and possibly the USA. 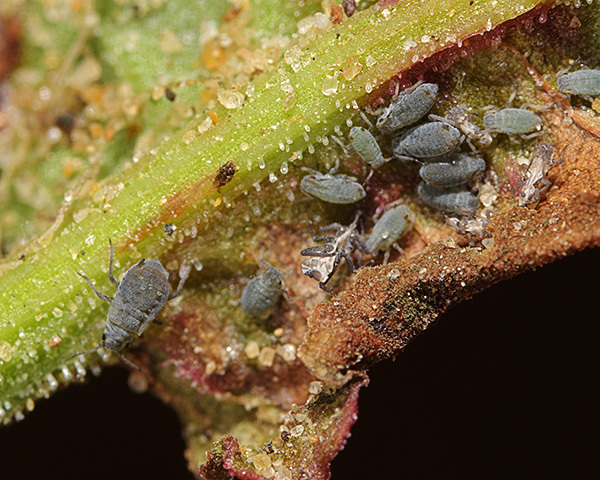 In southern (coastal) Britain, we have only found Dysaphis radicola on its secondary host (Rumex). 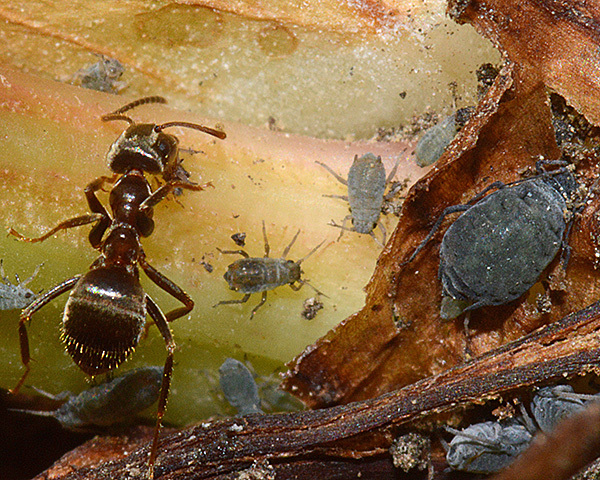 Populations are revealed by the activities of ants which tent over the aphids living at the base of the stem with soil particles. 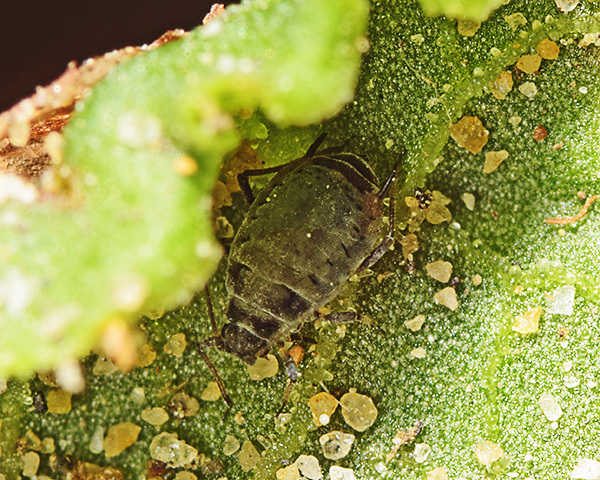 Although most of the aphid population is usually below the soil surface, they may also spread to infest the undersides of the lowest leaves of the dock plant as shown in the picture below. 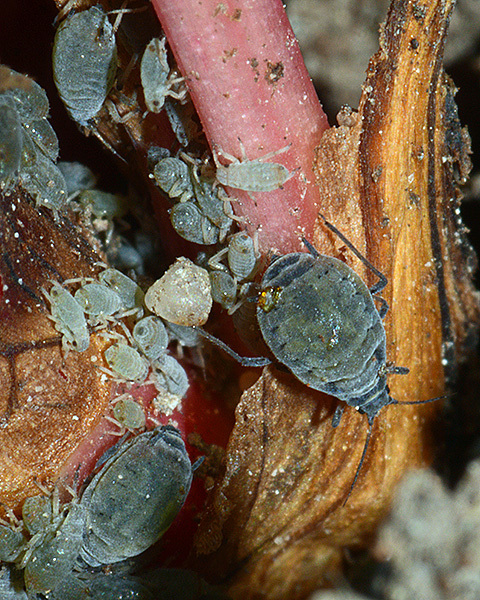 Dysaphis radicola is attended by ants on dock roots. All those we have found were attended by Lasius niger (see pictures below). 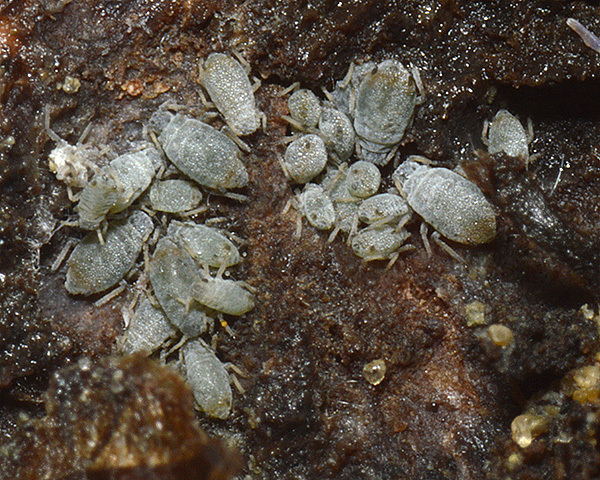 Despite its subterranean feeding site and the presence of ants, Dysaphis radicola has been found to be parasitized by Lysiphlebus fabarum in considerable numbers (Rakhshani et al., 2013). Dysaphis radicola has been recorded on 2 species of the Malus genus: Malus domestica (apple, European crab-apple, paradise apple) and Malus orientalis. 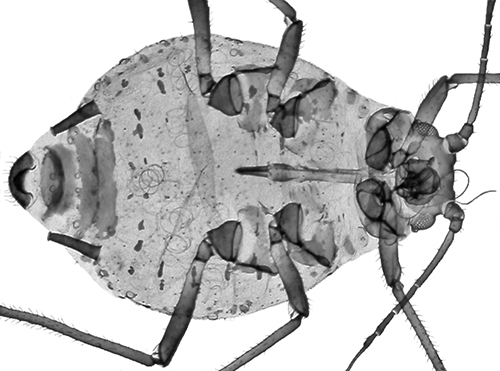 Of those aphid species, Baker (2015) lists 21 as occurring in Britain: Aphis aurantii, Aphis craccivora, Aphis fabae, Aphis gossypii, Aphis pomi, Aphis spiraecola, Aulacorthum solani, Dysaphis anthrisci, Dysaphis brancoi rogersoni, Dysaphis chaerophylli, Dysaphis devecta, Dysaphis plantaginea, Dysaphis radicola, Eriosoma lanigerum, Macrosiphum euphorbiae, Macrosiphum rosae, Myzus persicae, Nearctaphis bakeri, Ovatus crataegarius, Ovatus insitus and Rhopalosiphum oxyacanthae. Dysaphis radicola has been recorded on 7 Rumex species. We especially thank Aquaponic Life for their kind assistance, and permission to sample.